A modification Ben developed very early on in his career at the request of Miami-Dade County SRT members who wanted more room inside the trigger guard for better manipulation while wearing gloves. This mod quickly proved to be beneficial for everyone, as in addition to providing more room inside the trigger guard, it also improves trigger accessibility for small-handed/short-fingered shooters, and presents a polished and properly-angled frame surface above the trigger for the edge of the shooter's trigger finger to ride against while shooting. 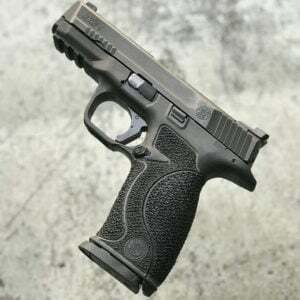 Signature Series GLOCK Grip Package Includes…. – Strategic material reduction for a less blocky more ergonomic overall profile, while maintaining structural integrity. 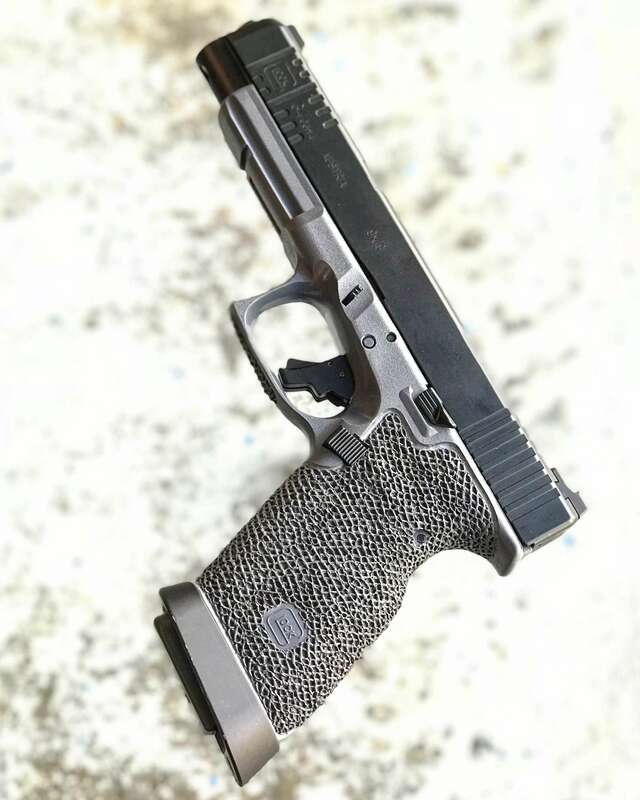 -Texture pattern is laid out on the grip in a shape that not only provides maximum contact for the shooter’s primary and support hands, but also complements the GLOCK pistol’s inherent “grain” and aesthetics. – Like the tread lugs in a mud tire, our distinctive texture profile effectively channels away liquids (sweat, blood, water, oil, etc) to prevent them from forming a slippery barrier between your hand and the grip. – Texture can be had in sharp, medium, or fine grades. We also offer a carry-friendly combo where the sides are less aggressive than the front and back, so as to not chafe your side or snag your concealment garment. – Texture is easy to clean with warm soapy water and an old toothbrush. -Where other aftermarket texture jobs can dull and wear away with light use, our texture pattern was developed specifically to withstand daily hard use by active-duty professionals. 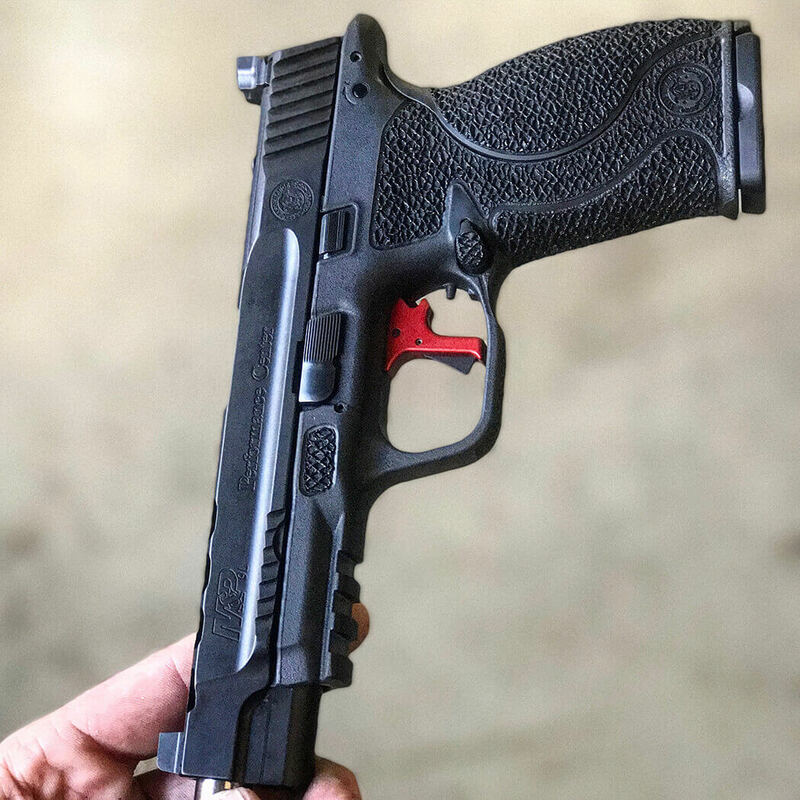 – We combine comfort and ergonomics with traction and speed by transitioning our texturing in key areas so as not to create hot spots or performance-inhibiting friction between your hand and the grip when drawing/manipulating/holstering the pistol. – The trigger guard/frame juncture is undercut and beveled convex on both sides to match the angle at which your middle finger rests under the trigger guard for both right and left-handed grip. This essential modification not only eliminates the gun’s tendency to bruise or blister the shooter’s middle finger knuckle, but also allows for a higher grip, which translates to better recoil management. -Based on your preference, you can choose to have the bottom of the trigger guard polished smooth or textured starting in front of the above-referenced undercut. Some shooters prefer a smooth trigger guard surface which allows them to slip their support hand in/out of the grip during reloads and manipulations; others prefer traction in that area to help keep the support hand front shifting under recoil. Select your preference on the order form. – Scientifically, the short tang found on GLOCK pistols provides very little leverage, and the blocky profile of the frame right beneath the tang forces the shooter’s grip apart slightly between the thumb and trigger finger, which weakens the shooter’s grip and increases the distance to the trigger. With this modification, we undercut the tang as high and deep as safely possible, which allows for a slightly higher grip, and places the web of the hand deeper under the tang for better recoil control and reduced trigger reach. Further, by enhancing the tang’s platform profile, this modification also reduces likelihood of slide bite for most people. If you prefer a flat front strap, you can opt to have the finger grooves removed completely. When the finger grooves are removed, the frontstrap is trued flat and reinforced to ensure structural integrity and not have the “wavy” look that”s so prevalent in mainstream grip work. However, if you like the added leverage finger grooves provide, you also have the option to keep them and have them reprofiled for a more natural fit. By framing the textured areas of the grip with deeply recessed edge lines at the top and bottom, it not only adds an element of aesthetic refinement to the overall package, but also helps to prevent your hand from slipping down or riding up the grip under recoil. The wide border around the magwell, which also curves over the lanyard hole, is spaced deliberately so as to not weaken those areas where the frame is thin and unsupported.